We wish all of our SAM families a wonderful, happy and safe Thanksgiving Break! Students will be released at 12:00 PM and Parent-Student-Teacher Conferences will conclude tomorrow. Please join us on Thanksgiving Day, November 22nd, at 9:00 AM for our November Family Mass (more details below). School will resume on Monday, November 26th. Happy Thanksgiving! St. Angela Merici Parish School is excited to announce our next Family Mass is Thanksgiving Day, November 22nd at 9:00 AM. In collaboration with other parish ministries, our students can participate as greeters, readers, and singers. All grades and families are welcome, and you can participate by signing up HERE. All students who attend in formal uniform may wear free dress on Monday, November 26th (please see the School Handbook for free dress guidelines). 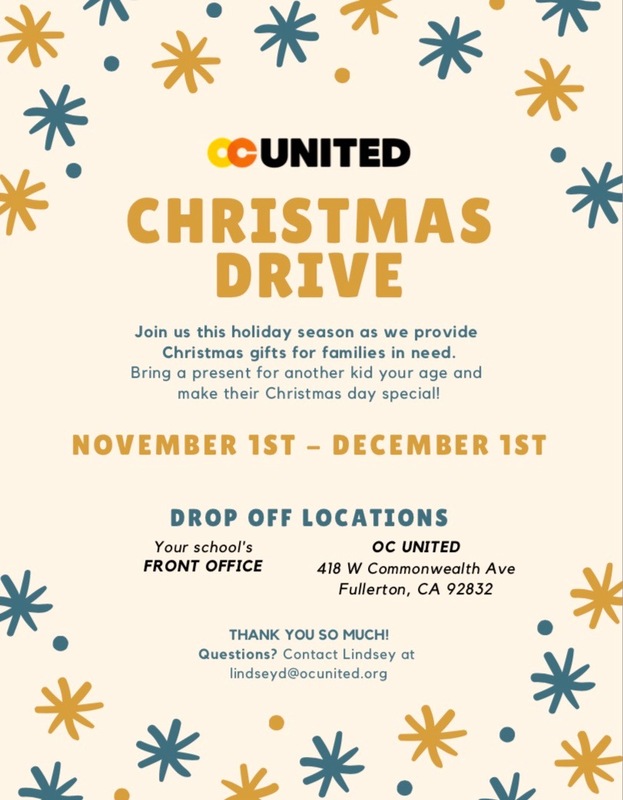 The November Charity of the Month is OC United’s Affordable Christmas Store. St. Angela Merici Parish School is helping OC United collect new gifts that allow aged-out foster youth, fostering families, individuals who are homeless, domestic violence victims, and families from at-risk neighborhoods to experience the joy of Christmas. We are asking for gift donations that are brand new, unused, and $15+. With your help, OC United can provide Christmas for 300 individuals. For Children: Legos, baby dolls, trains, board games, nerf-guns, transformers, etc. For Teenagers: portable speakers, insta camera, make-up, headphones, hydro flasks, etc. For Adults: kitchenware, purses, scarves, perfume/cologne, wallets, belts, etc. Would you like to submit an article to the Cougar News? Email all information to gro.a1555999845erbal1555999845egnat1555999845s@nay1555999845rj1555999845" >gro.a1555999845erbal1555999845egnat1555999845s@nay1555999845rj1555999845 (cc: gro.a1555999845erbal1555999845egnat1555999845s@aip1555999845atj1555999845" >gro.a1555999845erbal1555999845egnat1555999845s@aip1555999845atj1555999845) by Wednesday afternoon.